In 1874, The Sisters of Charity of Providence opened a boarding school for boys situated near St. Patrick Hospital. This school, named St. Joseph was the first Catholic school in Missoula. St. Joseph Elementary and Middle School is the oldest Catholic elementary school in Western Montana. We are a small, diocesan Catholic, co-educational elementary school that promotes college and career readiness, providing comprehensive and challenging educational opportunities for students in an environment of Catholic teachings. St. Joseph School personifies a safe environment in which students know and respect each other. St. Joseph School provides a small, accessible faculty, staff and administration whose dedication and belief in the individual student and Catholic education fosters their vision and professionalism. The school is a family-oriented environment, structured by a cooperative effort between faculty, administration, students and parents to promote high moral and academic standards. Parent involvement is key to the school’s success. Catholic teachings emphasize that parents are the first educators. At St. Joseph School, this belief is embodied in the partnership that the faculty and staff nurture with all parents to be active participants in their child's learning. As a St. Joe’s parent, you will experience the support of a caring and loving community surrounding your student. 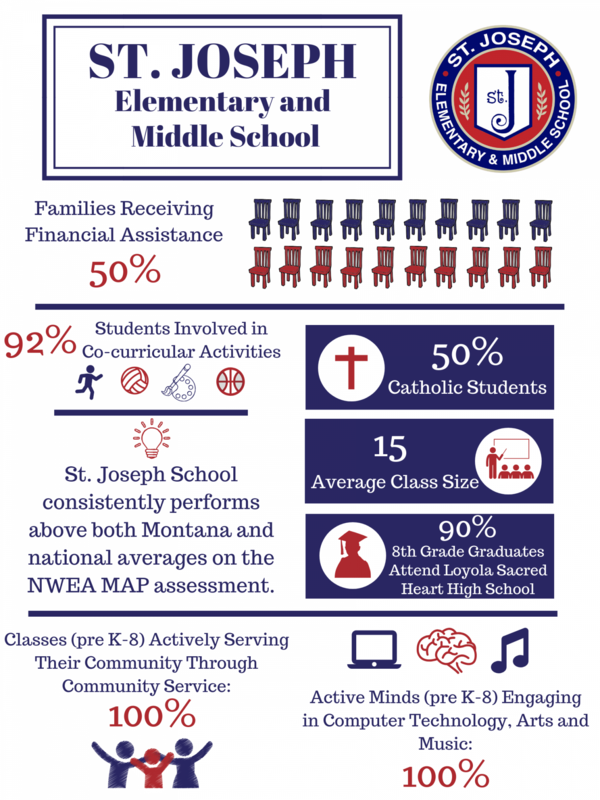 St. Joseph Elementary and Middle School is accredited by the Western Catholic Educational Association (WCEA). Responding to student needs, the academic year is divided into two 18-week semesters, offering a total of 36 instructional weeks. Classes are self-contained from grades K-5 and departmentalized in grades 6-8. Language Arts, Social Sciences, Math, Science, Choir, Band and Theology divide the coursework for students in these grades. 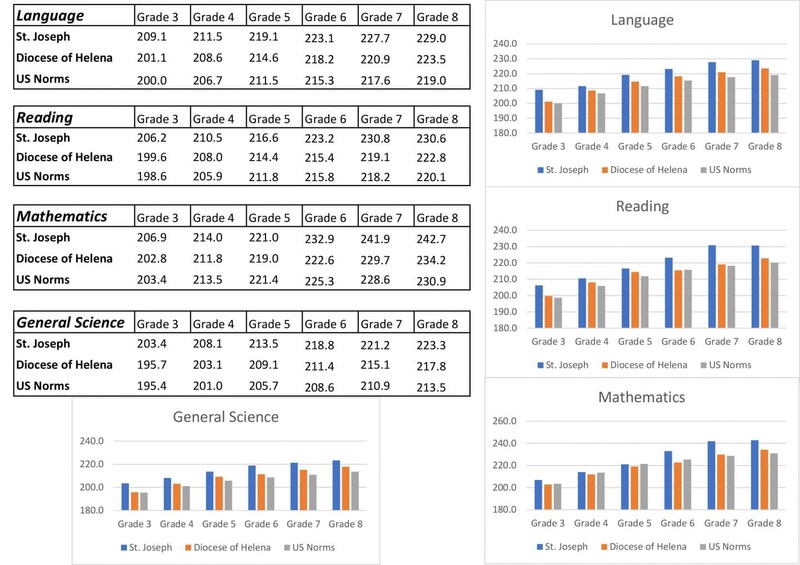 With a strong focus on spiritual development and the scholastic core subjects, SJS consistently scores above both Montana and National averages on the NWEA MAP assessment. St. Joseph Elementary and Middle School provides a high level of academic challenge to each individual student, supporting their unique strengths, talents, and learning styles. Approximately 90% of St. Joseph 8th graders continue their college preparatory education at Loyola Sacred Heart High School. Students at St. Joseph School receive a dynamic and responsive educational experience enhanced with faith formation and direct opportunities to answer the call the serve others. Beginning in PreKindergarten, students are encouraged to seek out opportunities to serve others in our call as missionary disciples. Throughout a student’s educational journey at SJS, they will experience an array of service opportunities. More importantly, they will actively reflect on the impact these experiences continue to share them into men and women for others. Grade level retreats, participation in prayer services and liturgies, enhances the social, emotional, spiritual and moral development of all SJS students.